Now that you’re engaged, wedding planning is in full swing! 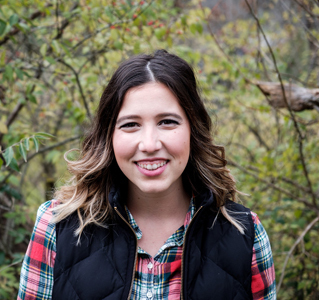 You’re thinking about your dream dress and the perfect venue, and somewhere in the back of your mind, you’re trying to narrow down the list of places to register. When considering your potential registries, keep in mind the stores that have it all: from kitchen appliances to bedding to TVs and outdoor furniture. 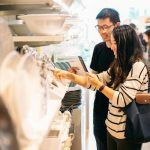 It will make adding items to your registry even more fun and it won’t overwhelm your guests in the process. 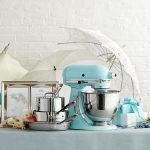 With this in mind, we asked Walmart to share with us their most popular wedding registry items. On Walmart.com, you can find the “Most Registered Items” so you’re sure not to miss adding a doormat or shower curtain. This is a great starting point as you begin the search for housewares and decor for your future home! If you are past the wedding stage and looking for Baby Registry ideas, Walmart has that too! 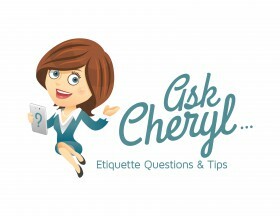 Just click here to find out all about Walmart Baby Registries. When I was planning my wedding and stockpiling my registry, my mom strongly advised that I choose something she calls a “bed in a bag”. And, because moms are always so wise, on my registry went a set similar to this one from Better Homes and Garden. I didn’t have to worry about registering for a down filler or extra pillowcases or matching throw pillows. It was already waiting for me in a convenient carry-all case! Similarly to the one-stop shopping of a “bed in a bag” comes this 8 piece towel set. 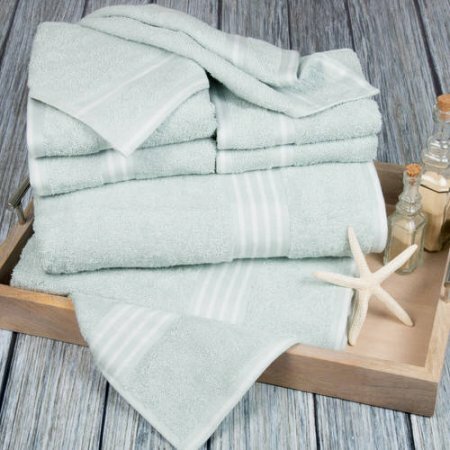 This will be the perfect addition to your new bathroom with 2 of everything: from bath towels to washcloths. There are more colors than you could ever dream of that will match all the other beautiful decor you’ve chosen. Bonus: register for a couple sets in different colors so you always have extra towels for guests who are visiting! The first thing Jon and I did after our mattress was delivered to our newlywed apartment was order a mattress topper. It wasn’t something we thought to register for and how we sorely regretted it! This double layered memory foam mattress topper will make any mattress- regardless of size or quality- feel like a true dream. While you may only have two people to feed right now, soon your home will be full of visitors and eventually the arrival of littles. Register for a large set of dinnerware so you’re always prepared when hosting a dinner party or just having your parents over for a nice meal. 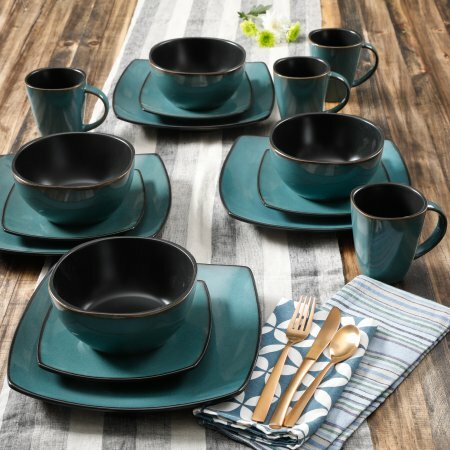 This stoneware set from Gibson Home is available in a host of beautiful colors and comes with everything you need to make a great impression for breakfast, lunch or dinner. 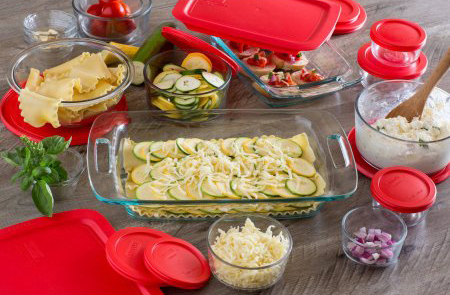 Cooking and storing your favorite meals has never been easier than with this Pyrex set. Prepare and bake a lasagna in the 9×13 pan, then pack the leftovers away in one of the smaller glass dishes with matching lid. Glass containers like these are easy to clean and don’t absorb the odors of your food like their popular plastic counterparts. You love watching Rachel Ray on TV, now bring her into your own new home with this set of hard enamel nonstick cookware. With all the pieces needed to craft a delicious omelet, stir a delightful stew or cook up your favorite pasta, you won’t be left wanting for anything with this in your kitchen. And who doesn’t love practical pieces that are also pretty? 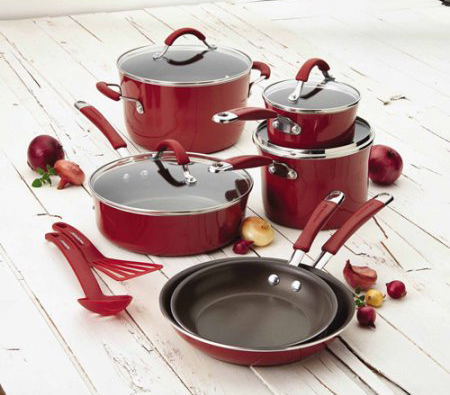 These pots and pans come in a variety of unique colors like this cranberry red and pumpkin orange. On some mornings, an entire 12-cup pot of coffee for two people on their way out the door to work may seem overwhelming. 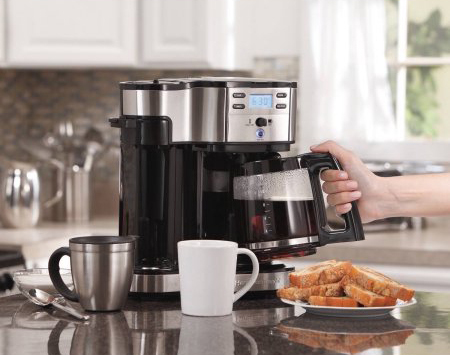 This Hamilton Beach coffee pot offers the option of single serve cups–with or without a coffee pod. Simply use your own favorite coffee beans to fill your travel mug before you leave the house. Its programmable timer will make getting your caffeine fix every morning even easier. 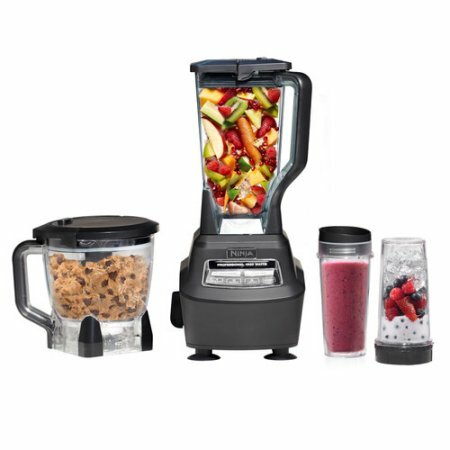 This blender can do more than just make a delicious and nutritious smoothie. You’re getting multiple appliances in one when you register for the Ninja Kitchen System. Take your smoothie on the go in one of 16 oz. cups. Use the 8 cup food processor bowl to chop and dice all the ingredients for your favorite recipe or prepare cookie dough with the detachable dough blade. The options are endless! 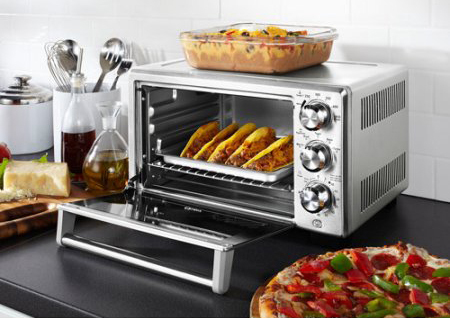 Cooking for two doesn’t always require a full size oven, but this Oster Toaster Oven is perfect for the task. Its turbo convection heat cooks food fast and evenly all while taking up little space in your kitchen. The interior is even large enough to cook your favorite large pizza. Growing up in South Florida, I took for granted the year-round “grill weather”. Now that I’m an Ohio resident, I’m practically chomping at the bit for weather warm enough to break out our little grill. 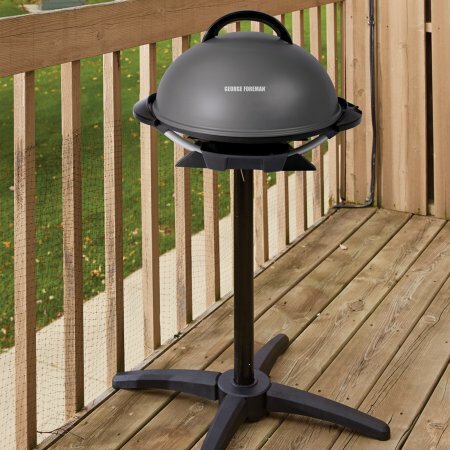 For couples like us in a northern state, a small grill that can be used both inside and outside is a great gift idea! This George Foreman grill has great temperature control and its nonstick surface makes cleaning up a breeze. Its sleek design won’t take up too much of that precious apartment space, either. We hope these top gifts have you thinking about your own wedding gift registry. 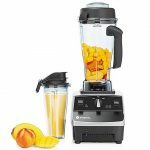 Walmart offers everything from bedding and small appliances to cameras and power tools, and has the potential to be your one-stop registry location. Click here to start your registry, then add items to it via Walmart’s website or their app. And remember to tell your friends and family they can always find your most up-to-date registry information at RegistryFinder.com. This post was originally published in 2014, but we’ve updated it to include the latest and greatest home goods from Walmart! completely confused .. Any tips? Thanks! Great web site you have here.. It’s hard to find excellent writing like yours these days. I’m really enjoying the design and layout of your website. It’s a very easy on the eyes. Did you hire a developer to create your theme? Excellent work!